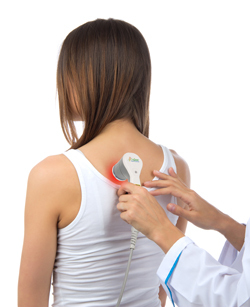 Our safe, soothing, state-of-the-art Class IV Aspen Therapy Laser can put an end to your pain fast! Aspen Laser Therapy is a non-invasive, safe, and effective treatment modality where light is used to relieve pain, reduce inflammation, and promote wound healing and soft tissue repair. This breakthrough therapy converts light into biochemical energy so normal cell function can be restored, resulting in reduced inflammation and fast pain relief. With deep healing Aspen Laser Therapy, our patients notice fast pain relief and recovery - often times avoiding invasive surgery and medications. Affordable laser treatment for Merritt Island. Laser treatment also serving Cocoa, Cocoa Beach, Cape Canaveral, Port St. John, Titusville, Mims, Rockledge, Viera, Melbourne and Palm Bay. DO YOU HAVE ANY OF THE FOLLOWING CONDITIONS? Aspen Laser Therapy could be your solution to comfort.